In Unreal Engine, I was able to tweak the BP_Sky_Sphere colors to give my scene a red glow. 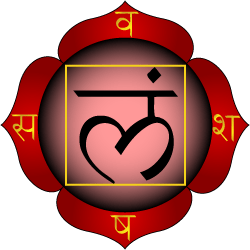 I then created a Material by importing a PNG image of the root chakra symbol, and applied that Material to a flattened Cylinder to form the disc that appears below the tree roots. For the music, I wanted to insert some placeholder music for now, so I selected this “Relaxing Traditional Music of West Java” that I converted to a WAV file from this Youtube video. Soon I hope to work with a local musician to use original gamalan (traditional Javanese) music instead. I watched this tutorial on how to insert background music. Now when you hit Play, the background music plays in the scene. 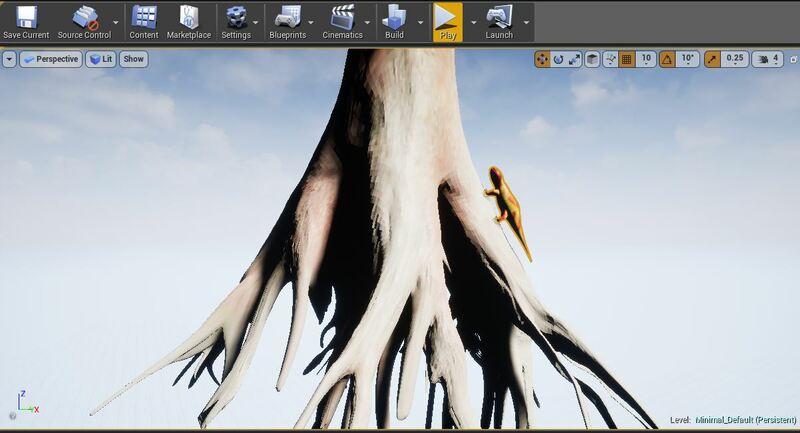 Here is the root of the tree inserted into a scene in Unreal Engine, with the salamander imported and positioned as well. Note: One of the first things I did was carefully create folders and subfolders for all the meshes I would be importing, because I think scenes and materials can get complicated quickly! Here is another view, where you can see the mushrooms, and also a cauldron I modeled. 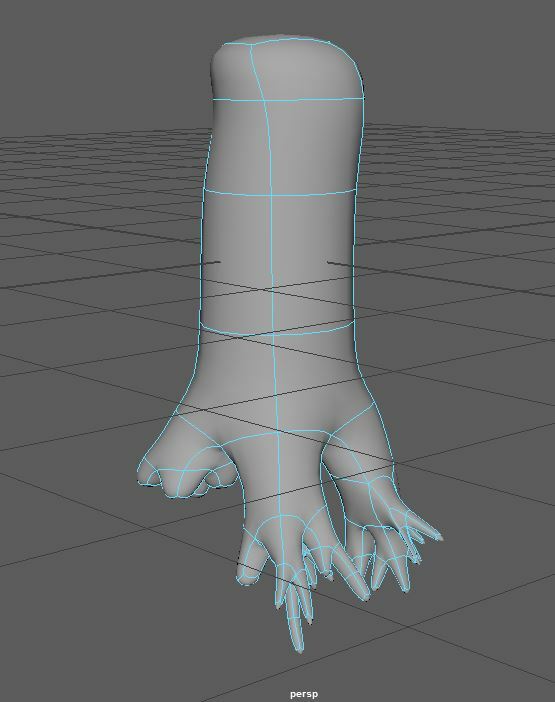 First, I began in Maya by creating a low-poly basic mushroom shape. 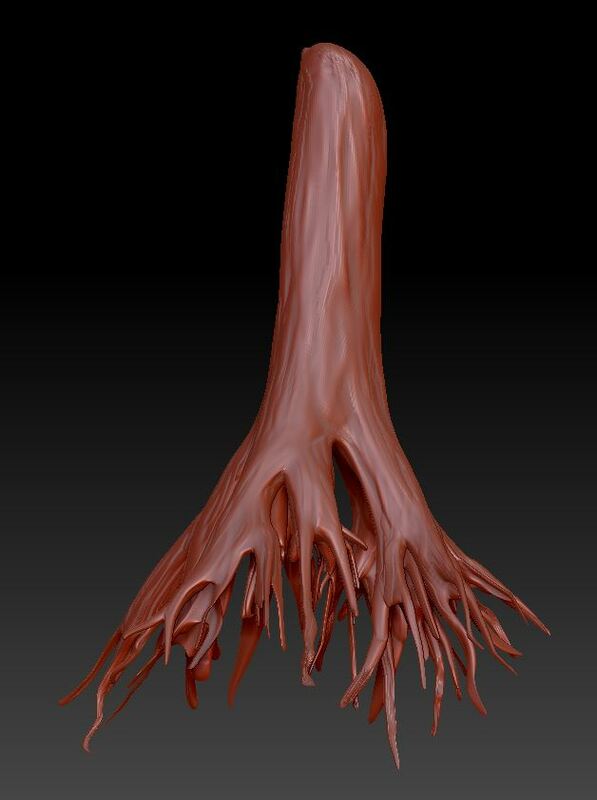 I then imported it into Zbrush and began shaping it with the Move tool, added some texture to it and polypainted it. 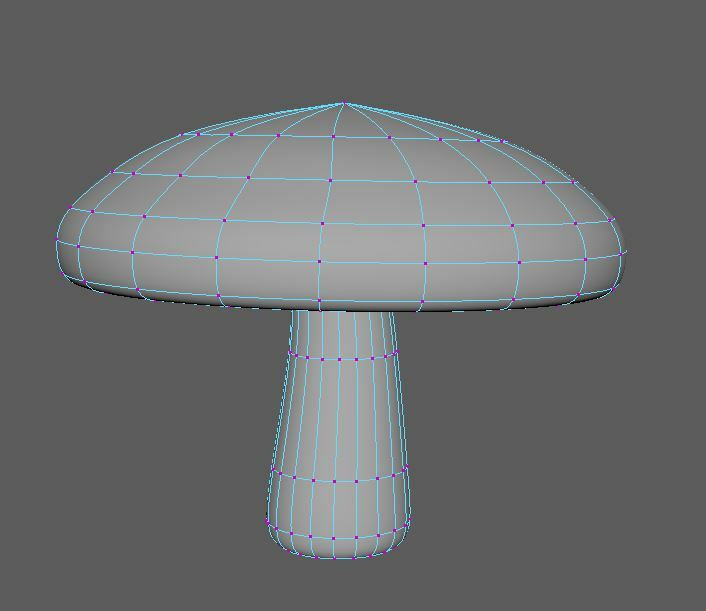 I then saved that mushroom as a Tool (ZLTool) and used the Append button to add it as another mushroom into my scene on a sub-layer. I repeated this process to add a third mushroom and used the move tool to bend and shape them a bit so each was unique. 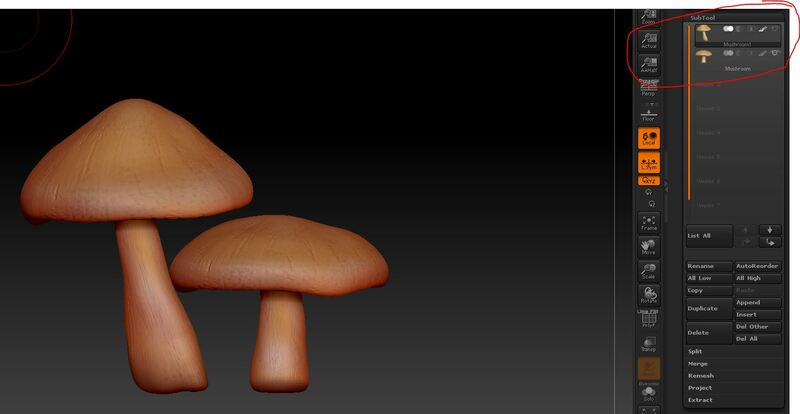 Lastly I used the polynormals tool to assist with UV unwrapping, exported the texture map (colors) and the normal map (bump), then exported the mushroom meshes back into Maya so I could re-wrap the texture and bump on them and export as an FBX to Unreal. 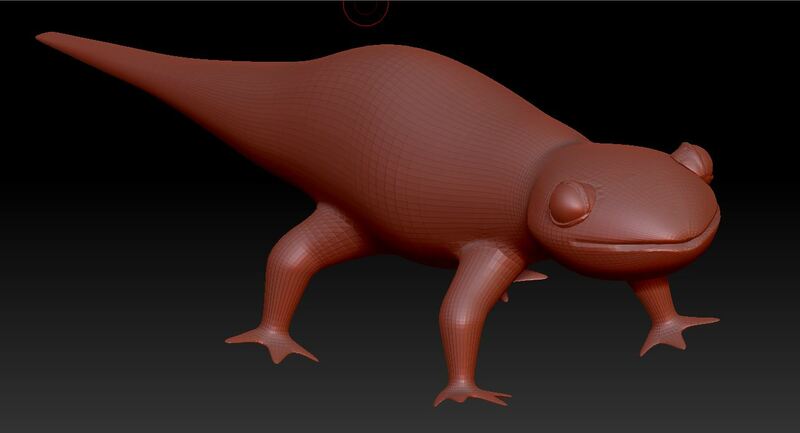 I applied final polypainting and texturing of the salamander in Zbrush and exported it as an OBJ to be brought into Maya. 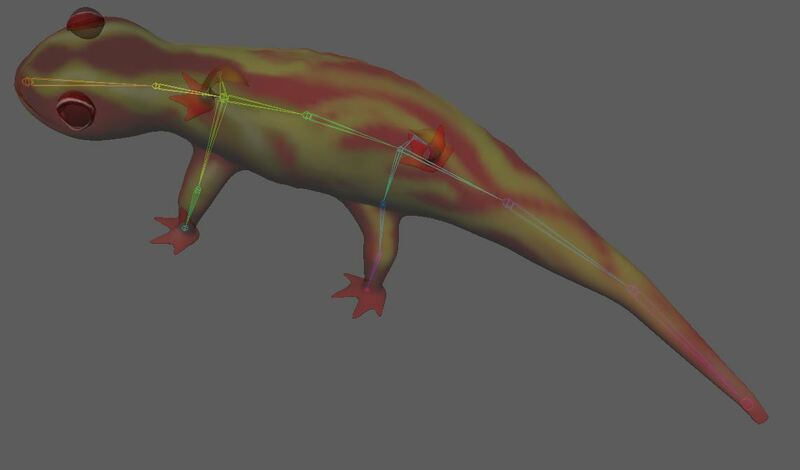 I turned on Xray view to create a skeleton and position the bones correctly into the mesh. 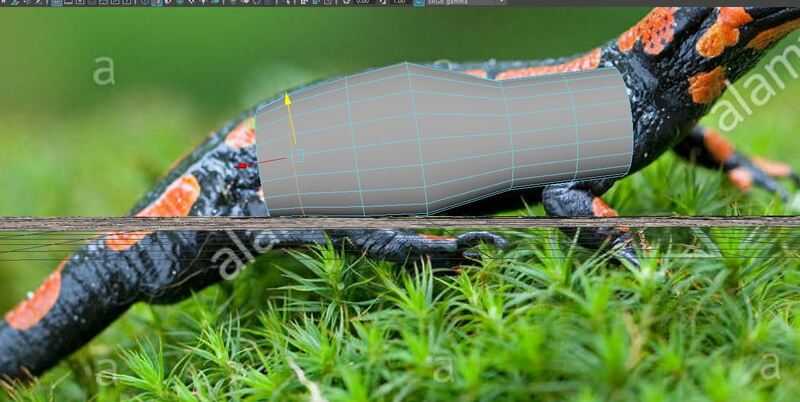 The final mesh with skeleton was exported as an FBX to be brought into Unreal. 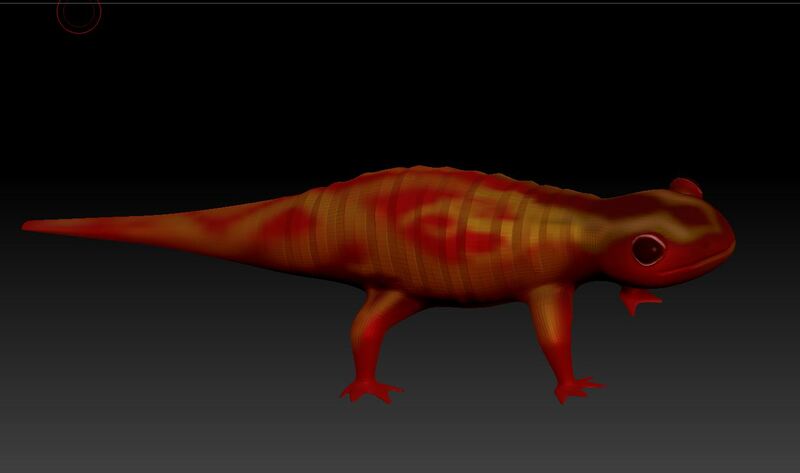 I imported my model from Maya into Zbrush as an OBJ file, then used the Insert H-Ring tool to create some elbow-macaroni type shapes above the eyes, then used the Move and Smooth tools to flatten and shape. 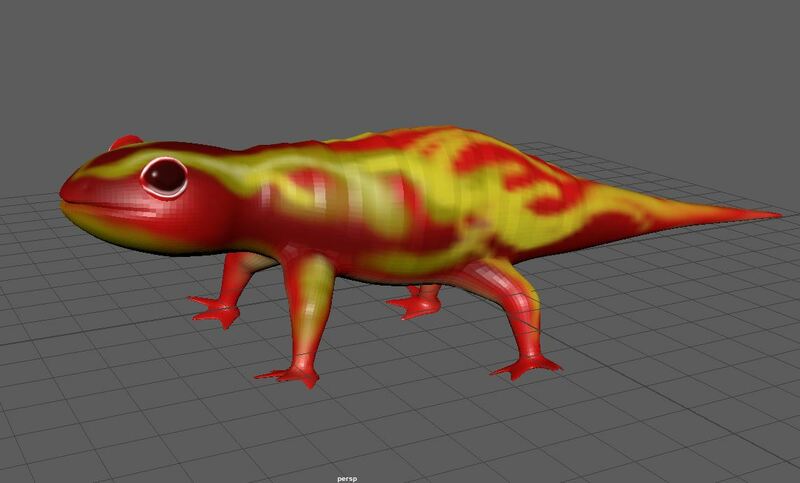 This weekend, I began creating the Fire Salamander for the Root Chakra. 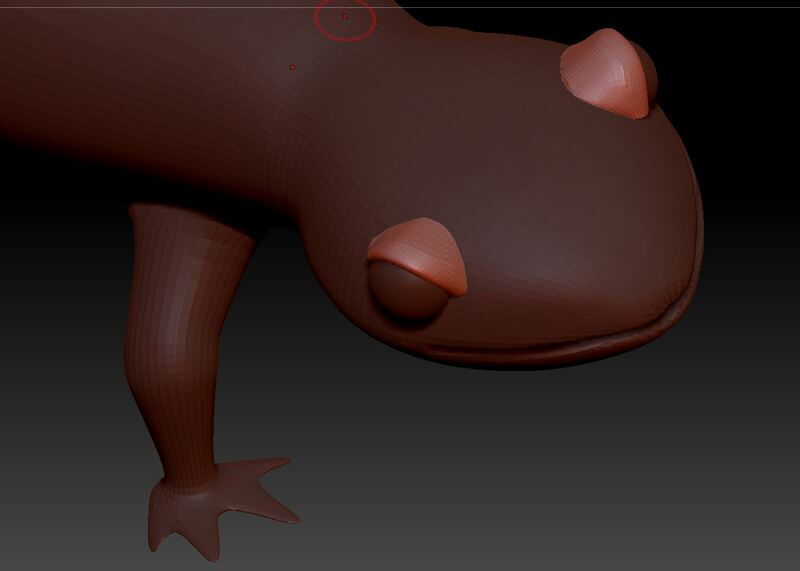 After an hour or so into it, I realized that my modeling felt clunky and wasn’t flowing smoothly. I began to feel I had started with too many subdivisions, which were unwieldy to control and shape. 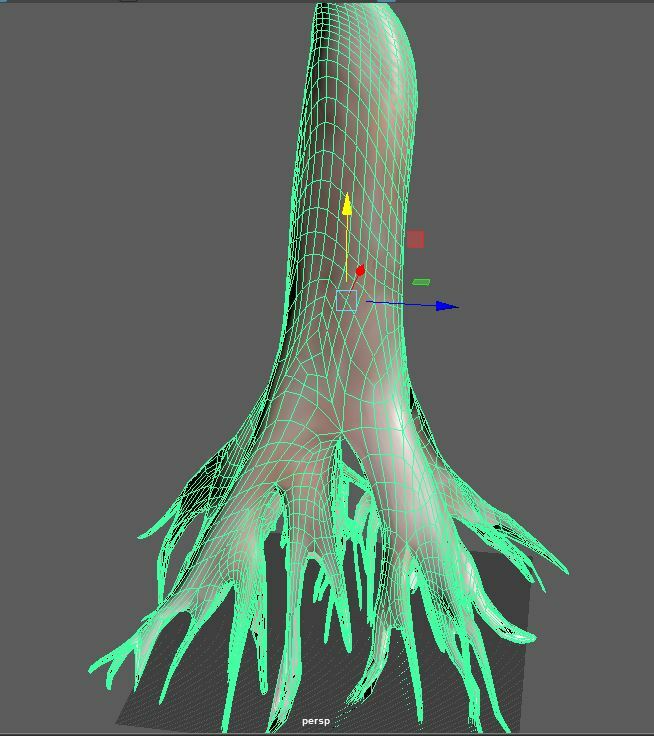 Every time I tried to select an area to scale, rotate or move, I had to select several faces/vertices. Also, it still looked very much like a box, not organic. 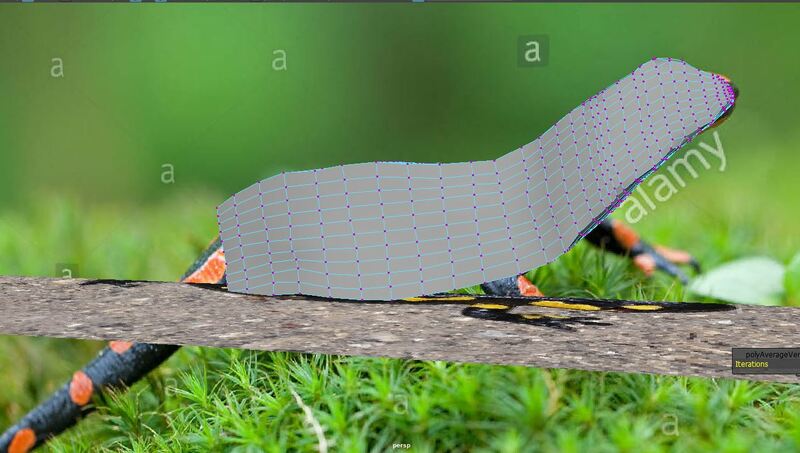 At that point Maya crashed, so I called it quits for the night. When I re-opened the file the next morning, something was wrong with it. Maya took several seconds to respond to any command, and seemed to seize up every time I made a selection. I decided to start over, since I wasn’t happy with that model anyway. This time I began with a cylinder, using fewer subdivisions, and began blocking out the rough proportions. This was much quicker. It took half the time that I spent the day before. 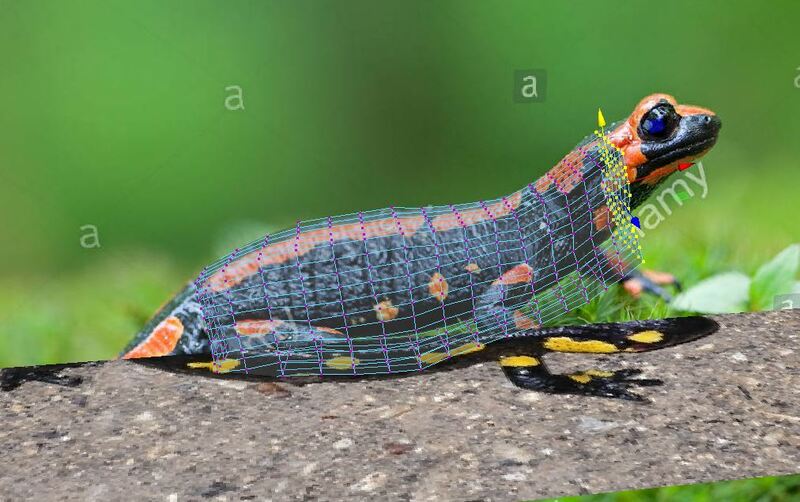 About halfway through the process, I came across a tutorial that pointed out the Maya now has several ready-made basic mesh templates you can use, including a LIZARD! 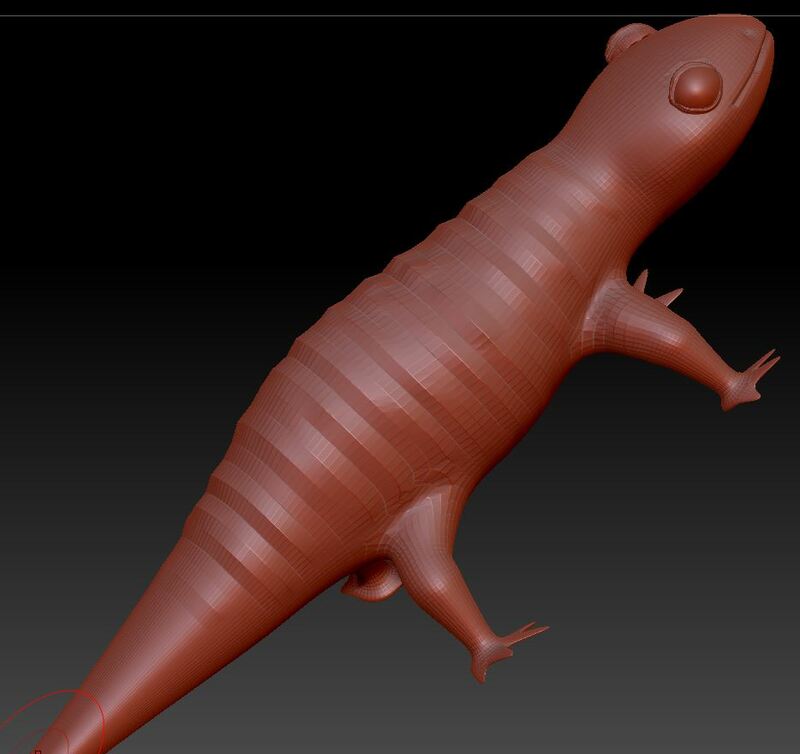 Although I would have shaved a few hours off my production time by starting out with a ready-made sculpt, I felt I got much better with practice doing this model and was glad I did it myself. 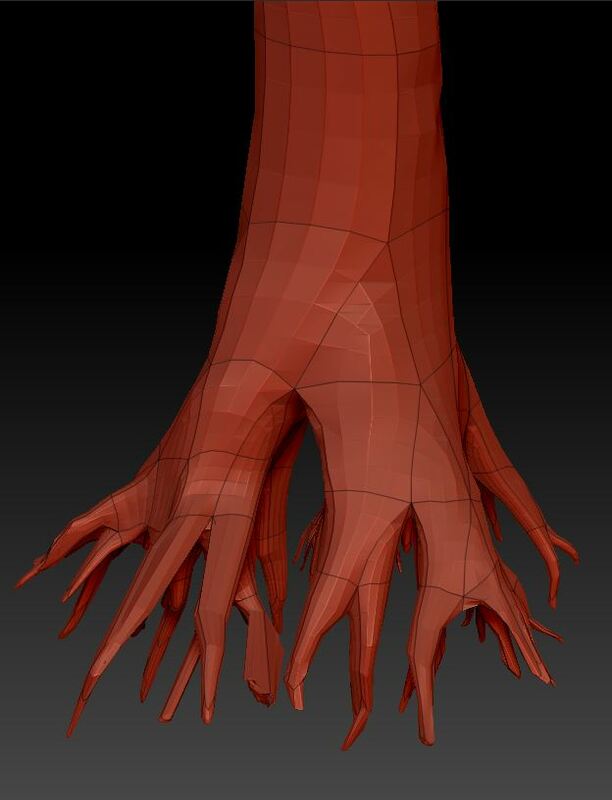 Up next – taking the model into Zbrush for more refined sculpting. Recently I refined the model in Zbrush and used Polypaint techniques to give it more color and texture. 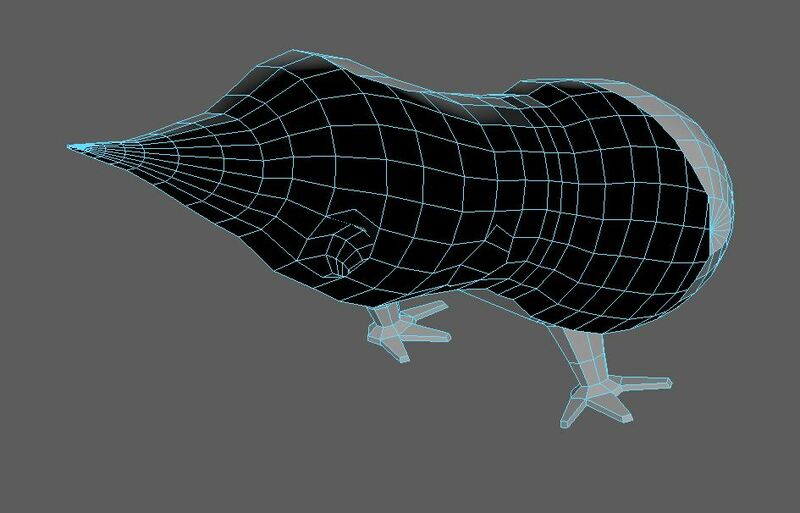 Then I imported it back into Maya with the textures so it can be exported as an FBX to Unreal. 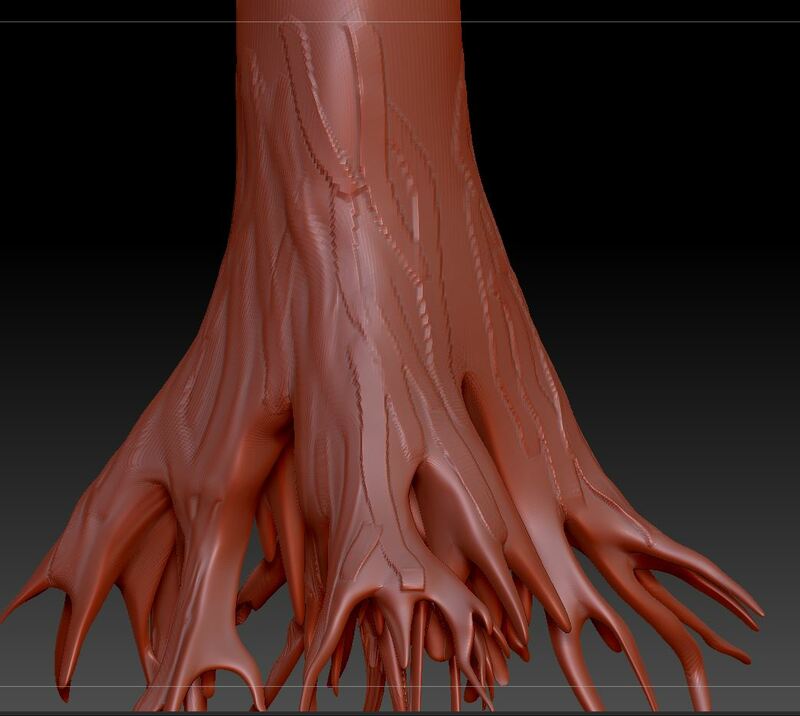 Once I felt I had enough branching roots, I imported it into Zbrush, and began shaping it more organically with the move tool. 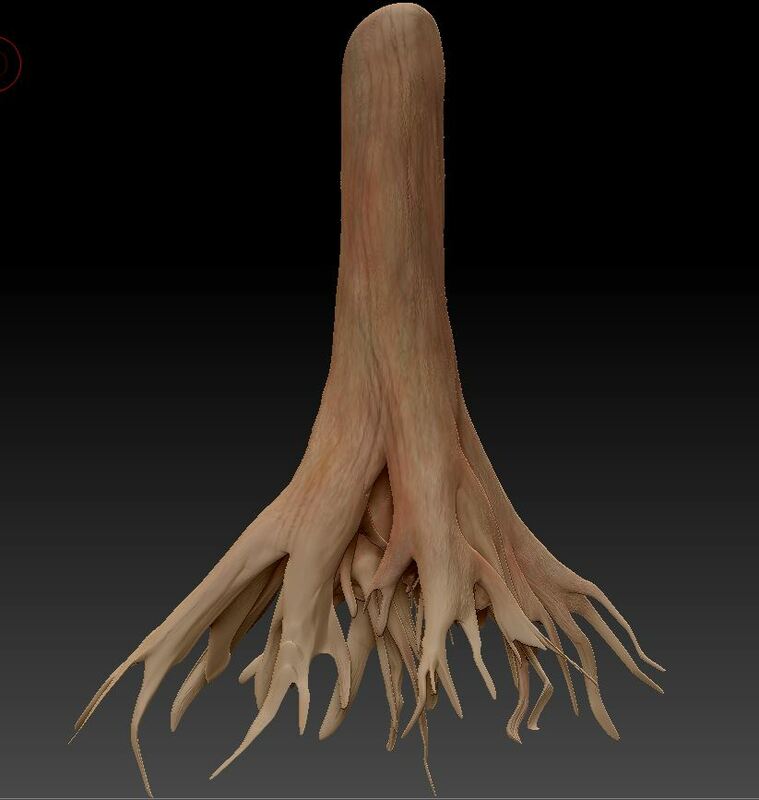 I continued to shape the roots by pulling with the Move tool and applying some texture with Clay Buildup and Clay Tubes tools. The first of the seven chakras. Physically it is centered at the base of the spine. Associations: Safety, grounding, basic physical strength, vitality and survival. 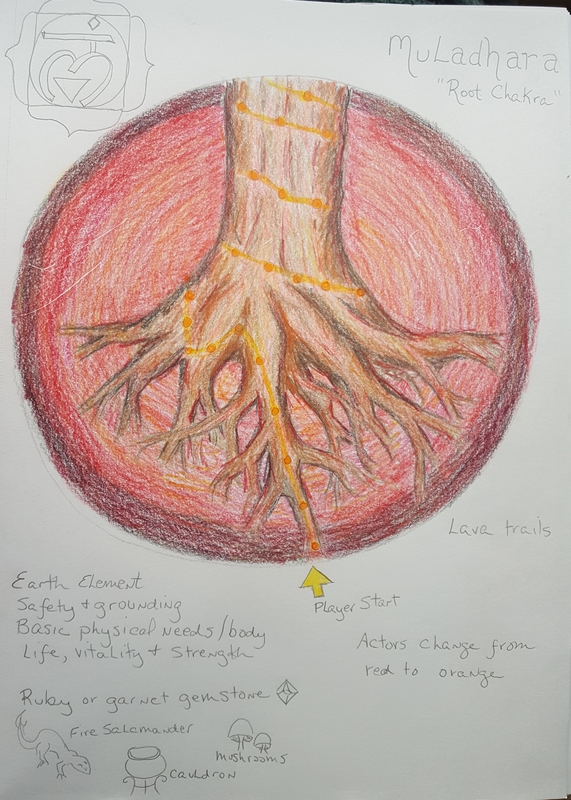 Player begins below the root system and travels upward via a “lava path” – a warm red light that guides the player up the roots. 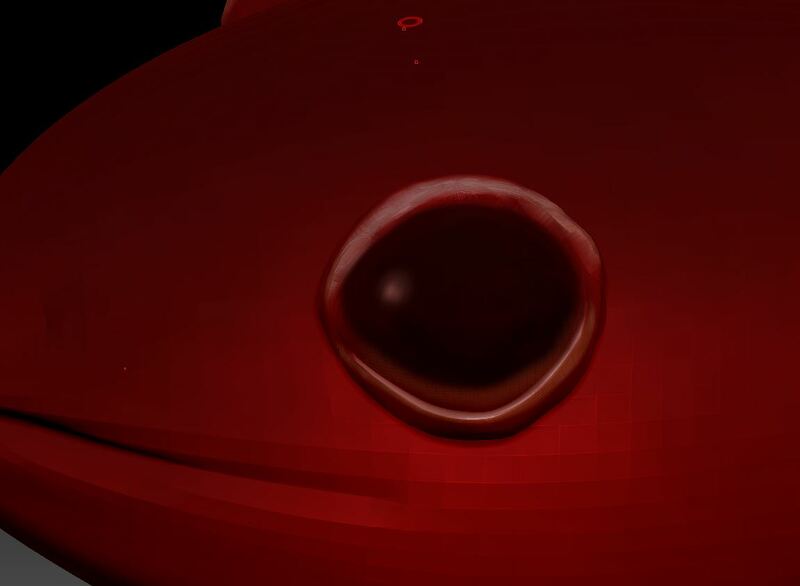 As the player climbs, they encounter red glowing “bubbles” that turn orange when the player runs over them. 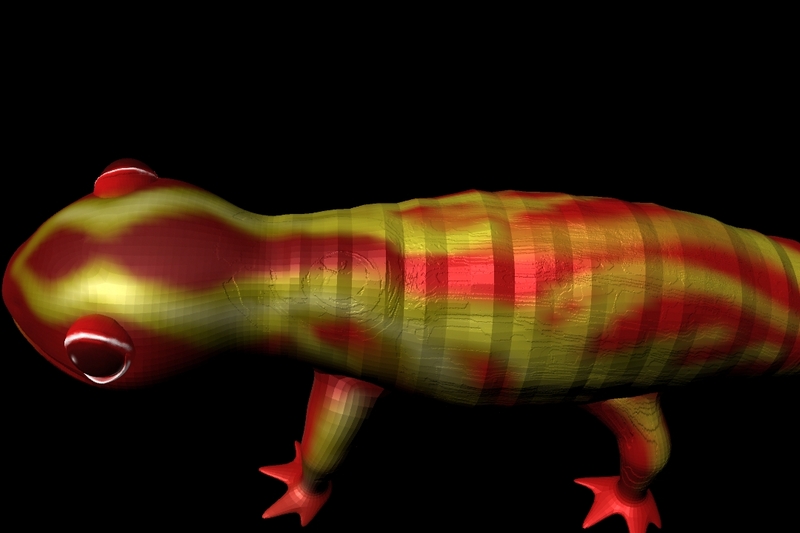 Along the way the player encounters 3D objects that symbolize the fiery root chakra (salamander, cauldron, etc.) These objects may also change (glow?) when the player encounters them. Once the player reaches the top, the level finishes. 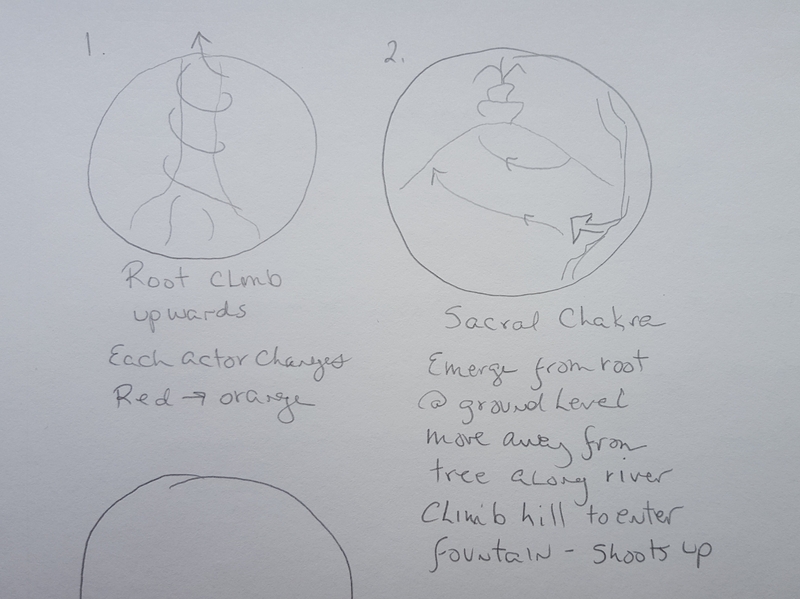 Level 2 will be the Sacral Chakra. 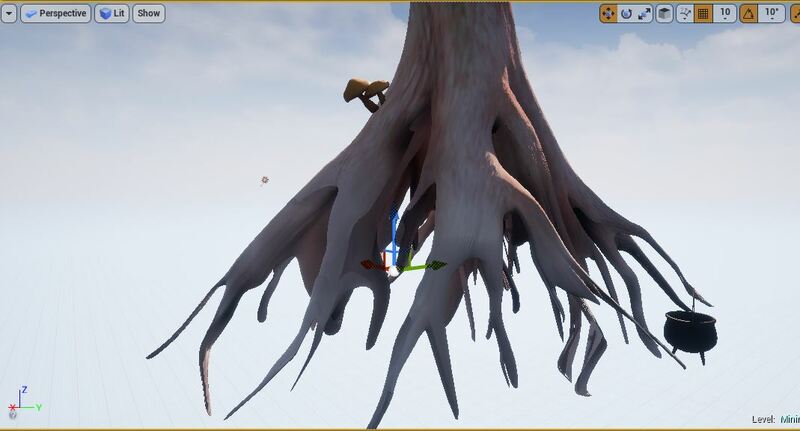 The player will emerge from the base of the tree root and climb a hill towards a fountain.